Serbian-born and now London-based Roksanda Ilincic, founder of Roksanda, finally launches a thrilling jewelry line, the experimental spirit and geometrical cuts of which perfectly resemble Ilincic’s traditional style. Roksanda’s first jewelry collection is getting unveiled exclusively at the designer’s Mount Street store in Mayfair, London, on Monday, November 30th. However its pieces officially made their actual debut at the Roksanda spring 2016 show during London Fashion Week earlier this September, leaving everyone speechless. 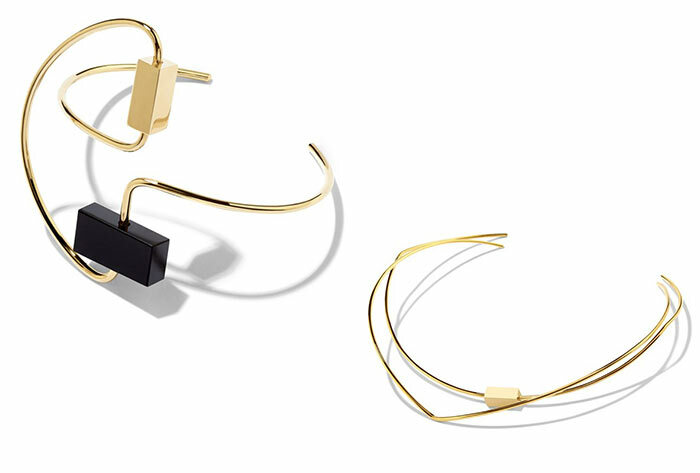 If you are one of those who couldn’t wait for Roksanda to finally sell her iconic jewelry pieces, get ready to spend from $770 to $1,042 to get a piece. The collection consists of gold-plate bracelets, necklaces, earrings and even brooches, and is surely to be remembered as a great debut line. The graphic modernist fashion designer, who has just celebrated her house’s 10-year fashion anniversary, has thus finally explored another side of her creativity, taking great source of inspiration from her latest ready-to-wear collection. Roksanda, like a contemporary Piet Mondrian (one of the founders of the modern movement De Stijl), simplifies the elements of her creations for this collection, preferring simples lines and shapes, like rectangles and triangles, and making each one of her pieces a one-of-a-kind item. Moreover, thanks to the asymmetrical balances utilized, Roksanda’s jewelry collection makes it possible to combine sophisticated lines with unconventional designs. Like Mondrian himself, Roksanda also seems to categorize the world in vertical and horizontal elements, at times interrupting them with some fancy diagonal and wavy patterns. Doing so, she definitely proves to be one of the greatest abstract art champions of the modern times. It is also interesting to notice how this jewelry collection strongly reminds us of Roksanda’s educational pathway, whose first direction originally brought the 38-year-old fashion designer to major in architecture at the Faculty of Applied Arts in Belgrade. The appeal of Ilincic’s pieces has always lied in her incredible craftsmanship and sophisticated lines, whose delicacy has so far charmed many celebrities and royalties such as the Duchess of Cambridge, Michelle Obama and Tilda Swinton. Such elegant lines will thus still play a huge role in the fashion industry thanks to this new experiment of hers, once again confirming why she has become a must-seen, as well as a habitué at any London Fashion Week. Roksanda Ilincic’s debut jewelry collection may also be a turning point for the designer herself, who always had jewelry design in mind. According to one of her latest statements, we could expect even more jewelry collections from the brand: “I am big jewellery collector, and designing jewellery has always been something I wanted to do. After the opening of my Mount Street store it felt like it was the right time, and I was interested to explore this new category,” the designer told WWD. If you are in London, make sure not to miss Roksanda’s newest debut!